How Are These Two Cars Different? Founded in 1900 in Cambridge, Massachusetts, the Crest Manufacturing Company was a supplier to other early automobile manufacturers. They finally realized that they built so many parts that they could just build their own car – and so they did. The first “Crest”-branded automobiles were three-wheelers but by 1901 the four-wheeled Crestmobile was available. Three models were offered at the start, with the mid-range Model B sporting a 3.5 horsepower single-cylinder engine mounted out front that can be pull-started with a leather strap. This car resembles many other cars from the period, including the Toledo Steam car below. Part of this particular collection since 1943, the Crestmobile you see here has been restored (though the date is unknown). Crestmobiles were only offered through 1905 before the marque disappeared. This one, perhaps the finest in existence, should sell for between $30,000-$40,000. Click here for more info and here for more from this sale. Five different steam cars were offered by Toledo in 1902, with this Junior Runabout being the cheapest, costing $800 when new. This was also the last year the company offered steam cars, turning to more conventionally-styled gasoline-powered cars in 1903 before their acquisition. This car sports an older restoration and it probably hasn’t been used all that much. It will require a little attention (and a boiler inspection) before use. This is a great opportunity to acquire a well-built early steamer at a fraction of the cost of a Stanley. It should bring between $33,000-$40,000. Click here for more info and here for more from this sale. 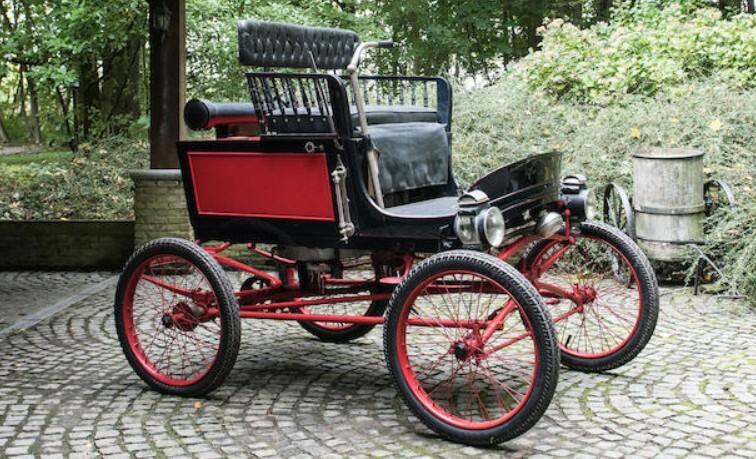 This entry was posted in Uncategorized and tagged 1901, 1902, 3.5hp, auctions, Bonhams, cars, classic cars, crestmobile, junior, model b, runabout, steam, toledo by classiccarweekly. Bookmark the permalink. Most information was correct about the Toledo; Col Pope’s conglomerate did not but the company in 1904 as he already owned the American Bicycle Company (1899) that first made the Toledo and the newly formed International Motor Car Company that “took over” AMC. The Toledo in the sale needed at least $40,000 spent on it. That’s probably why someone was able to pick up a 100+ year old steam car for 30 grand. Glad someone’s willing to invest the cash to keep it around.